New Zealand bowlers showcased a brilliant performance as West Indies batting line-up crumbled for a second time in the first Test to hand the hosts a massive win by an innings and 67 runs on Day Four here at the Basin Reserve on 4 December. Resuming at yesterday's score of 214-2, the Caribbean side struggled after a staunch effort by the top order, losing their three wickets to reduce to 286-5 prior to the lunch. Following the lunch, West Indies suffered a dramatic collapse and lost their last five wickets for just 33 runs in nine overs to hand the Kane Williamson-led side a big win. Opener Kraigg Brathwaite had anchored the top order, scoring a 91-run knock besides sharing a 94-run stand with Shimron Hetmyer (66) for the second wicket. Kieran Powell and Shai Hope also made a strong start and looked set for big innings, but they too failed to counter the Black Caps' bowling attack and were dismissed for 40 and 37 respectively. 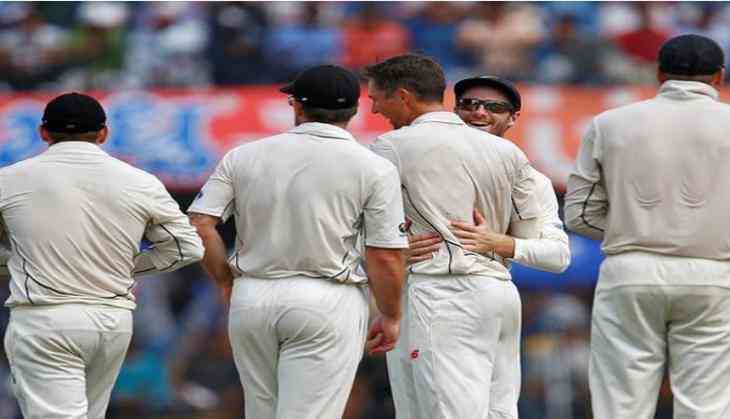 Matt Henry was the pick of the bowlers for New Zealand as he picked three wickets by conceding just 57 runs while Colin de Grandhomme picked two wickets by giving away 40 runs. Neil Wagner and Trent Boult also took two wickets each, with Mitchell Santner also chipping in with a wicket. Earlier, de Grandhomme (105) and Tom Blundell (unbeaten at 107) struck blistering centuries while Ross Taylor also notched a 93-run knock as New Zealand posted a huge total of 520-9 declared in reply to West Indies' first-innings score of 134. The match also saw Wagner finish with his career-best figures of seven for 39 in the first-innings of the Caribbean side. With the win, the Black Caps have taken a 1-0 lead in the two-match series against West Indies. The two sides will play their second and final Test at the Seddon Park in Hamilton.